Presenting assets as minimized icons helps you to keep your Intuiface experience clear and simple. Assets remain in view and users can "open" them to expose their content. Composer enables use of an image to serve as an icon representing your asset when it is minimized. Add an asset (an image or a document, for example) to your experience, and in the main scene, select your new asset (if it is not already selected). In the Properties panel, under the Container Behavior tab, select the checkbox for the Show minimize button property. A Minimize button is automatically added to the asset's container. Set the Initial view state property to Minimized. Note how the asset is immediately minimized in Composer. In the Minimize behavior section of the properties window, use the Minimized image property to select the image. In Composer, the asset is now displayed as a minimized icon. 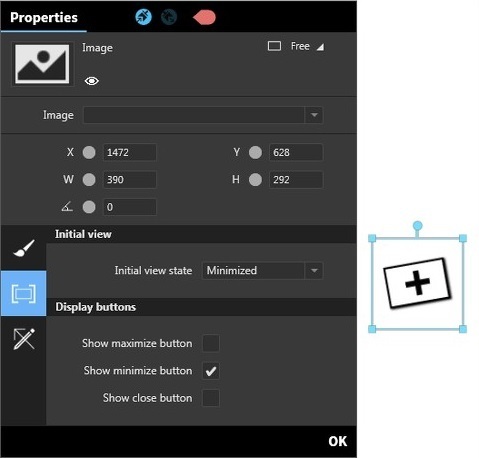 Close the properties window, and resize/reposition your minimized asset if necessary. Hit F5 to see the result of your modifications --> If you interact with the minimized icon, the corresponding asset is displayed with its normal size and properties.